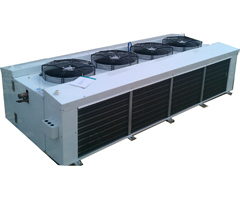 DHF Series double side air-blowing evaporator is the cooling equipment for the food processing workshop inside the room matching with the outside condensing units which blows soft air from both side. 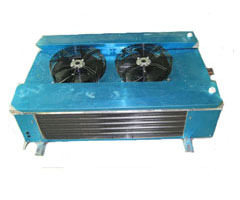 By the suited temperature, it is divided into 2 series: L, D. Each is suited for the room requiring 0℃, -18℃. 1.The shell is of aluminum and magnesium alloy plate, corrosion-resistant, and beautiful outlook. 2.The coil is of crossed arranged inner screw copper tube, with high heat exchange efficiency. 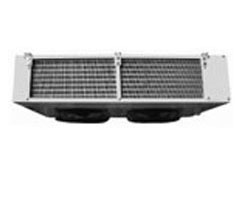 3.The external rotor fan, with double side air-blowing, soft and low noise. 4.The electric heating tube of good quality stainless steel is evenly deployed inside the coil, having good defrosting effect. 5. Specification is as the PDF file.